Early this morning, I was at the Santa Monica Pier. It was 5:30 am and it was still dark. I walked my way into the pier and walked around all the shop fronts, the hallways of the pier, and the pier itself to the end of it. 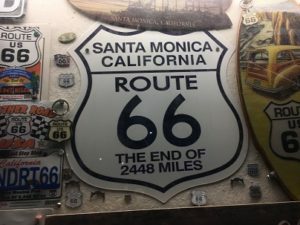 Found out that the Santa Monica Pier is the end of the famed Route 66. Bob Dylan committed it to song and a lot of artists have mentioned it since. Route 66 – The highway, which became one of the most famous roads in the United States, originally ran from Chicago, Illinois, through Missouri, Kansas, Oklahoma, Texas, New Mexico, and Arizona before ending at Santa Monica, California, covering a total of 2,448 miles (3,940 km). The road has become part of other highway systems, after it was officially closed. The pier has been used in a lot of films and TV shows, most notably, Chuck, when Chuck defuses a car bomb rigged by Laszlo underneath the pier (he first meets Laszlo while playing in one of the arcades on the pier). The pier has been owned by the Gordon family for generations and continues to be run by subsequent generations of the family. I took a lot of pictures although the shops were closed and it was still dark. 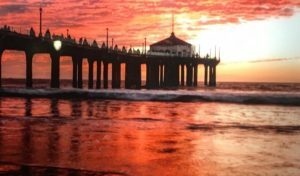 It was great to see the Santa Monica Pier, made famous by being the end of ROUTE 66 and was sang about by famous artists such as Bob Dylan. From the pier, I walked to the surf and took my shoes and socks off and dipped my feet into the early Pacific surf. It was cool but delicious. I have not set foot in the Pacific since the 70’s. Now, I like to travel for fun or if the current assignment requires it. I’m currently in Southern California, visiting my son and while here, I like to explore and find new trails and new adventures. Today, it was Santa Monica and Venice. Here are the pictures of my adventures today. This entry was posted in Media, Social, travel by admin. Bookmark the permalink. Copyright © 2019 Evemaran All Rights Reserved.